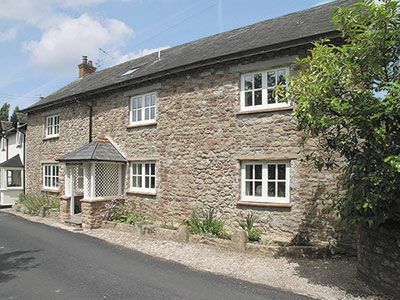 This beautifully appointed and restored 18th-century cottage is located in the village of Washford, a short distance from the West Somerset coast and on the edge of Exmoor National Park. The cottage also has a stream running along the edge of the garden. 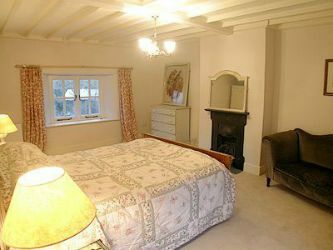 This three bedroomed cottage will comfortably sleep up to six people. 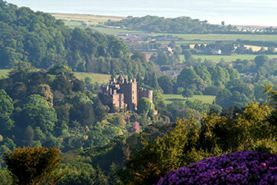 Whether it is the dramatic scenery of Exmoor, the rolling hills of the Quantocks, the seaside towns of Watchet or Minehead, the medieval village of Dunster, or even a trip along the West Somerset railway, is a luxurious haven from which to discover the beauty of Somerset. 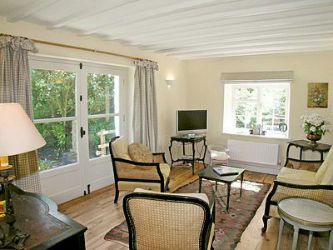 The garden has a furnished summer house overlooking the stream and other sitting-out areas. Superb scenery and walking on the south west coastal path or inland on the moors. Dunster castle and Watchet harbour nearby. 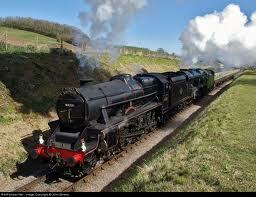 Washford has its own station on the West Somerset steam railway. Shop and pub 500 yards. Hi, we are Nigel and Sue Cook. We bought the property in 2009 as we fell in love with the property when visiting friends nearby. 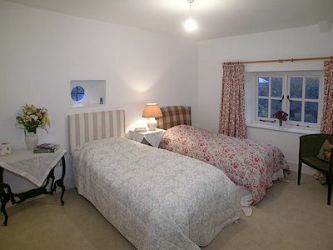 We had the property totally renovated to its current high standard and if you enjoy the cottage as much as we do, you will have had a thoroughly enjoyable holiday. We bought Riverside Cottage because it is in an ideal and tranquil location. 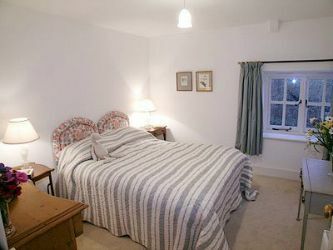 It is not far from beautiful Exmoor and local villages and towns are just a short drive away. Changeover day: The changeover day is Friday. Visitors should depart by 10:00am and new guest should arrive after 3:00pm. 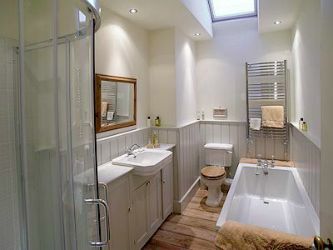 Bathrooms: Family bathroom upstairs with separate shower, bath, toilet and basin. Kitchen: Hob, Oven, Fridge/Freezer, Microwave, Dining Table and all the usual items you would expect in a well stocked kitchen. Utility Room: Washing machine, basin, airer etc. Garden Room has a TV, Freeview box and a selection of games and puzzles. Other: Garden has a summer room. linen/maid service: Towels and linen are included in the booking price. Notes on accommodation: Steps to unfenced stream flowing length of property/garden. Off road parking for two cars. Outside: Patio table, large garden, summer house and bridge over Washford stream leading to the parking space/drive. Cycle store. Up to 8 weeks – no cancellation charge. *The cancellation/deposit refund depend on whether or not we are we are able to re-let the holiday period. 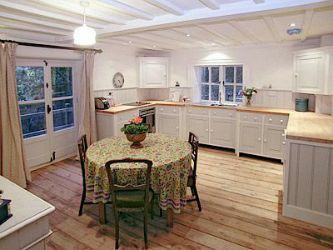 "Beautifully decorated and light; the house was instantly relaxing. We also appreciated the thoughtful touches (fruit etc) by the landlord. We thought the property wasn’t really done justice by the photos on the website. Sept 2010. 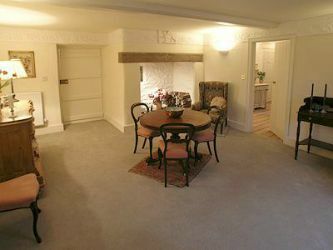 One of the nicest comfortable, well equipped properties ever stayed in. 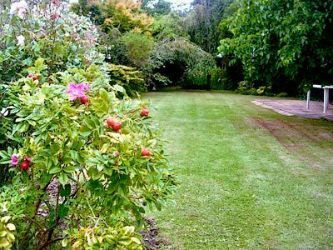 Very comfortable, plenty of room and beautiful garden. July 2010. The cottage is even more lovely than it looks in the photos. An idyllic spot. With young children aged 3 and 6 we were worried about the river running the length of the garden. However it was shallow enough to paddle in with wellies and it was quite magical walking over the wooden bridge to the house. We told the children they were not allowed on the steps to the river or on the side path next to it without a grown up but infact the river became a real asset and fun part of the holiday rather than a worry. May 2010. Any furnishing and fixtures described in these details are for general information only and as such must not rely on them being included with the property rental.